At the press conference for its new season held last June 21, Red Turnip Theater presented its line-up for what is shaping up to be a fascinating new season. The company’s fourth season will consist of Nina Raine’s Tribes and Jennifer Haley’s The Nether. Notably, the award-winning playwrights are the first female playwrights whose works will be brought to life on stage by the company. Both plays address the central theme and topic of Red Turnip’s fourth season, identity, by showing how identity is found and established within and outside of a physical community. The season opens with TRIBES, a family comedy-drama centered on a deaf young man who was raised in a household where he was forbidden by his hearing family from learning sign language. His life turns around when he meets a woman who was raised in a deaf family, and is beginning to lose her hearing. Abroad, the play has garnered an abundance of recognitions including nominations for the Lucille Lortel Awards, Outer Critics Circle awards, Drama League awards, and the Olivier Awards, and was awarded a Drama Desk award, New York Drama Critics Circle award and an Off-Broadway Alliance award. 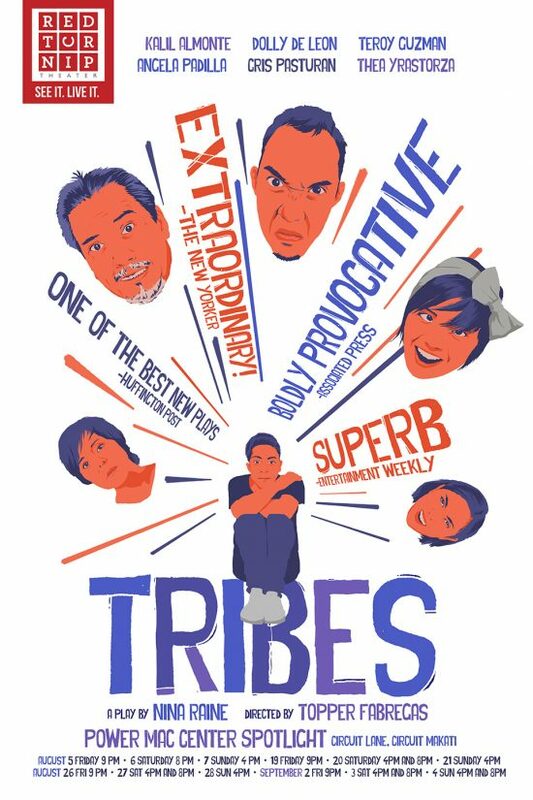 Red Turnip Theater’s Tribes is being directed by Topper Fabregas, with a powerhouse cast consisting of Kalil Almonte, Angela Padilla, Cris Pasturan, Teroy Guzman, Dolly de Leon and Thea Yrastoraza. Red Turnip also teased subtitled performances of Tribes in order to make the show more accessible to deaf and hard-of-hearing audiences. Performances of Tribes will begin in early August and end in September at the Power Mac Center Spotlight Theater. THE NETHER caps off Red Turnip Theater’s fourth season. The play is described as both a “serpentine crime drama” and a “haunting sci-fi thriller” where the Web has evolved into a tangible, habitable environment where different, sometimes unsavory, fantasies flourish unrestricted by the rules of the “real” world. The show is set to have Ana Abad Santos at the helm, with Jenny Jamora and TJ Trinidad leading the cast. In terms of the feel of the material, Abad Santos likened The Nether to the 1982 Ridley Scott cult film Blade Runner (starring Harrison Ford) because of their shared hybridized detective noir-science fiction style. She also teased her interest in incorporating Japanese art into the aesthetic of the production, particularly that school of art’s reliance on symbolism. The Nether opens in March 2017 at the Power Mac Center Spotlight Theater. Besides its main line-up for the season, Red Turnip also confirmed that a “0.5” production (similar to their staging of Kenneth Lonergan’s This Is Our Youth last year) is in the works, but it would still be keeping the material under wraps to finalize more details, and that the official announcement can be expected after Tribes.